Thank you for attending NECA 2015 San Francisco! It was a huge success that wouldn’t have happened without you. We had more than 6,000 convention-goers make their way to the Bay Area for the weeklong activities. From the opening reception at the world-famous Exploratorium — where conventioneers and guests enjoyed over 650 interactive exhibits ranging from mechanical contraptions to “physical phenomenon” artworks — to the closing concert given by Kenny Loggins that had attendees getting Footloose, there was plenty to do and see in San Francisco. Highlights of NECA 2015 San Francisco included dynamic speakers such as education visionary Sal Khan who shared his global vision of learning and the creation of the Khan Academy. And, in the Closing General Session, endurance swimmer Diana Nyad talked about her historic swim from Cuba to the United States and the importance of having a dynamic team. NECA 2015 featured 69 educational sessions addressing growth opportunities for electrical contractors, including effective leadership communication, risk management, 2014 NEC Significant Changes and NFPA 70E Updates. The NECA Show included over 300 exhibitors presenting thousands of solutions. The Showstopper Showcase boasted 23 winners this year, including NECA premier partners Milwaukee Tools and Southwire. The first-ever Selfie Station, sponsored by Graybar, was a huge hit! More information will be available at www.necaconvention.org. Endurance swimmer shared her insights and a firsthand account of her record-breaking swim, after four failed attempts, from Cuba to Florida during the Closing General Session at NECA 2015 San Francisco last week. Nyad’s dreams from an early age involved swimming. Her Greek-Egyptian father and French mother supported her, but her focus eventually became very intense after that. “That’s how people get ahead in life – they’re fanatics,” she said. Words of wisdom came from a fellow teenage swimmer, who talked about this importance of discipline and focus. “It’s the moment that produces the dream, not the big picture,” she said. And that’s what she did from that point forward. After failing to qualify for the Olympics, Nyad was introduced to the world of endurance swimming, which would take her around the world. The Cuba swim represented Mount Everest to Nyad. For about three decades, Nyad focused on other ventures such as broadcasting, but she always kept her eye on Cuba. Feeling more like a spectator than a doer and having turned 60, and despite some very public failures, she set her sights on the island nation again. Support and attention ebbed after her fourth failed attempt, but she kept telling herself to remember the importance of the power of the human spirit. That carried her until Labor 2013, when she finally reached her 110-mile goal in about 53 hours. Before Nyad took the stage, NECA CEO John M. Grau talked about the value of NECA membership and cited the conventions as one of the benefits. “We’re really one big family, and this is our over-the-top reunion,” he said. He emphasized that members don’t necessarily buy things from NECA, but they belong to NEC. “Working together makes us special,” Grau said, pointing to issues such as workforce shortages and multiemployer pensions. ELECTRI Council Chairman Greg Long also presented an update on the group’s research progress. NECA later recognized several award winners after before Grau spoke, including George Adams (McGraw Award), Dennis Quebe (Comstock Award), Wilson Yancey (Coggeshall Award), David Mackay (Wendt Award), and Brian Damant (Distinguished Service Award). Federated Insurance won the Industry Partner Award. The National Electrical Contractors Association (NECA) 2015 Convention and Trade Show was deemed another rousing success, with more than 6,000 members and Chapter staff attending this year’s events in San Francisco. The annual gathering continues to be an exciting mix of opportunities for education, inspiration, networking, and fun! “Every year, they get better and better,” said Sonja Rheaume of Christenson Electric in Portland, OR. NECA kicked things off by hosting the opening reception at the world-famous Exploratorium where conventioneers and guests danced the night away with music from the Milwaukee Tool band. Located at San Francisco’s Pier 15, the Exploratorium is internationally recognized as the premier museum of science, art and human perception containing over 650 interactive exhibits ranging from mechanical contraptions to “physical phenomenon” artworks to high-tech computerized displays. Attendees were able to explore museum exhibits, enjoy specialty cocktails, fortune telling, karaoke and much more! On Sunday, the NECA Show opened with the ceremonial ribbon cutting by NECA executive director, Beth Ellis. The NECA Show is the #1 trade show of it’s kind in the electrical construction industry presenting the largest gathering of manufacturers and distributors showcasing thousands of solutions contractors need to save time and money on the job, and grow their business. Other meetings included theNECA Business Development Meeting, the Women in NECA (WIN) Roundtable and the NECA Student Chapters Job Fair and Green Energy Challenge. Iowa State University was named the winner of the Green Energy Challenge. The student team from Iowa State beat out two other finalists, Penn State University and the Illinois Institute of Technology, for the top spot. Purdue University won the poster contest. Charles Freeman of Gulf Electric in Mobile, AL and his wife Shaleen said they enjoyed their trip to the Bay Area. They gave rave reviews for all of the presentations at NECA 2015 San Francisco, especially the one about Alcatraz, Life on the Rock. Chart-topping musician Kenny Loggins had NECA 2015 attendees getting Footloose when he performed an exclusive concert Tuesday evening for the closing celebration at the Warfield. Be sure to check out NECA’s Flickr stream at flickr.com/necanet for photos of everything that went down during NECA 2015 San Francisco — we may even have one of you! Next year’s convention will take place in Boston, October 7-10 at the Boston Convention & Exposition Center. Save the date and be sure to sign up again when registration opens on June 3. More information will soon be available on necaconvention.org. 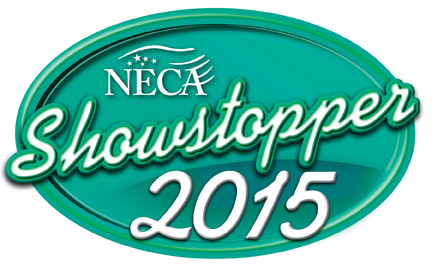 ELECTRICAL CONTRACTOR magazine announces 23 winners from 189 contenders in the 2015 Showstopper Awards. The annual awards honor the best new products in diverse categories, selected during the 2015 NECA Convention & Trade Show in San Francisco, October 3-6. “The Showstopper winners represent product ingenuity in a $130 billion industry undergoing significant transformation,” said ELECTRICAL CONTRACTOR Publisher John Maisel. Selected by an independent panel of judges, ELECTRICAL CONTRACTOR magazine has sponsored the annual Showstopper competition for more than 30 years. The winners will be featured in the January 2016 issue of ELECTRICAL CONTRACTOR magazine. ELECTRICAL CONTRACTOR magazine’s latest market research shows that electrical contractors make specific system and brand decisions more than 70 percent of the time across the electrical spectrum – including security, fire, life safety, communication, lighting controls, building automation and systems integration. Electrical contractors specify, install and service fully integrated, high-performance building systems in commercial, industrial, institutional and residential markets. Published by the National Electrical Contractors Association (NECA), ELECTRICAL CONTRACTOR magazine reaches 80,000+ electrical contractors and 68,000+ electrical contracting locations, more than any other industry publication. (301)-657-3110 /www.ecmag.com / Twitter@ECMagdotcom. NECA 2015 San Francisco attendees heard about the history and some common misconceptions surrounding Alcatraz, one of the most infamous prisons in the world, from a panel of experts at a special session held on Monday. The panel included a former prisoner on the Alcatraz, a former guard, a daughter of a former guard and an expert on the island. The former prisoner, Robert Luke, was released from Alcatraz 56 years ago (and has been married for 42 of those years). As he described his experiences on the island, he mentioned that one of the downsides of Alcatraz was the smallness of the prison. “There was no place to go,” he said. He struggled with violent tendencies and was moved around several times during his stay. But he worked jobs and read every chance he got, sometimes two or three books a week. As the daughter of an Alcatraz warden who moved to the island at age 7, Jolene Babyak had fond memories of the place. She went to school in the city, and friends could come to visit. Most escapes happened at the other side of the island during the day, when she and her peers were at school. Her family moved away and then back when she was 15 in 1962. It was then that she experienced dealing with a prison escape – she and her family were safe – and her first kiss. Georgie De Vincenzi, a former prison guard on the island, said he had pleasant memories as well. But some memories were also very violent, as he described at the panel. He witnessed two murders within his first few years on the job and dealt with well-known inmates such as Robert Stroud, George “Machine Gun” Kelly and Billy Cook. John Martini delved into the history of the island, which closed in 1963. It was occupied by Native Americans for a year and a half before coming part of the National Park Service. Approximately 1,500 men were incarcerated there. Martini said movies have created a “mythological Alcatraz” because of its isolated nature. “The real Alcatraz is a far cry from that,” he said. Luke agreed. “It’s either very exciting or very dull, mostly dull,” he said. There was very little gang activity or drug use, he added, and the underground units stopped being used in 1938. So why did Alcatraz shut down? Check out our Flickr feed @necanet for daily photos and tag yourself or share your photos using ‪#‎NECA15‬! New photos go up every day, be sure to check back! Iowa State University was named the winner of the Green Energy Challenge at the Opening General Session of NECA 2015 San Francisco on Sunday. The team from Iowa State beat out two other finalists, Penn State University and the Illinois Institute of Technology, for the top spot. 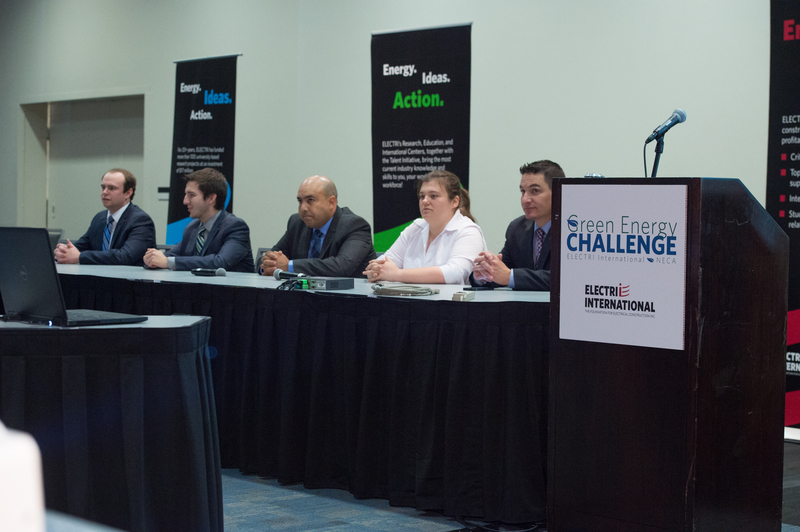 The three teams made their final presentations and fielded questions form a jury of electrical professionals on Saturday. The jury then deliberated and made their final decision. The project from Iowa State was upgrading an administrative services building on campus. Project results included increasing the building resiliency of the facility, incorporating green energy generation and implementing a complete lighting retrofit with an attractive payback period. 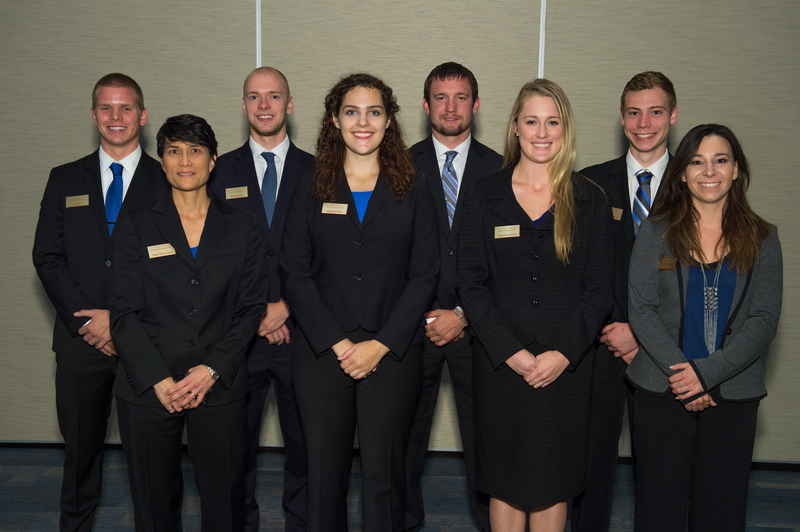 Team members include Lucas Baxter, Caleb Bonderer, Dylan Busby, Joe Hahn, Maggie Holt, Joe Kern, Bryan Marroquin, Regan Smiley, Rick Smith and Britta Sortland. The group’s faculty advisors are Jenny Baker and Beth Hartmann. There was also a poster board contest component of the challenge. Seven poster boards were displayed at Moscone Center South to be judged. Purdue University’s poster board was name the winner Sunday. Purdue’s team of students took on an energy retrofit project at Lambert Fieldhouse. The project proposal involves adding a 150 KW Photovoltaic system to the roof of the athletic facility and upgrading the LED fixtures throughout the building. Along with the upgraded technology, daylight harvesting will be used to light the main part of the fieldhouse. Team members include Joe Seacat, Alec Bucks, Riley Seahorn, Collin Seren, Taran Murphy, Wesley Gunning, Nick Myers, Taylor Samsil and Evan Solgere. The group’s faculty advisors are Brian Loss and Scott Santon. NECA member and District 7 Vice President Skip Perley led a group of innovative leaders in the electrical industry to discuss business development at a meeting Saturday at NECA 2015 San Francisco. Perley focused on how contractors can turn their everyday businesses in a way that separates themselves from their competition. The first speaker was Jake Millan of Tesla Energy. His goal was to show contractors how to come up with ideas to drum up new business. The mission of Tesla, he said, is to accelerate the world’s transition to sustainable energy. He noted that the first smart car has Tesla batter in it, and the company now has the largest distribution of batter systems in the world. Millan also described the Tesla’s array of products, including electric cars and batteries, in detail and took questions from the audience. Next, Michael J. Johnston, NECA’s executive director of standards and safety, talked about the business opportunities of NFPA 70E. He also provided an overview of sharing the responsibility between employers and employees and how the standard’s requirements are integrated into electrical contractors’ operations. Finally, he discussed the hierarchy of safety controls. Electrical safety is a shared responsibility between employers and employees, he concluded, and 70E requirements are an integral part of electrical contractor operations. “Right away, safety pays, and safety training pays,” said Dan Henrich of PDE Total Energy Solutions. To cap off the afternoon, Tim Speno, President and CEO of E2E Summit, introduced a presentation from Ekso Bionics, which helps survivors of stroke, spinal cord injury and other forms of lower extremity to walk again. Sal Khan, founder and CEO of Khan Academy, a global nonprofit with the mission of providing free, high-quality education to “anyone, anywhere” in the world, shared his vision for learning at the Opening General Session NECA 2015 San Francisco on Sunday. The impetus of Khan Academy started about 10 years ago, when Khan heard from an aunt that his cousin was having trouble understanding certain math concepts. “She had become convinced she didn’t have the math gene,” Khan said. Soon, after he got off work, Khan started doing lessons with his cousin through instant messaging and she started to improve. He started tutoring other cousins as well. Scheduling conflicts led Khan to posting lessons on YouTube and it grew from there. A hedge fund analyst with degrees from MIT and Harvard, Khan ultimately decided to quit his job and pursue his work in education. But it wasn’t without doubts. He received $100,000 from a key backer early on, which helped him get things off the ground. Then, he got noticed by Bill Gates. And Google reached out. That momentum enabled Khan to get office space and start building a team. Khan said Khan Academy is set up similar to the way you play a video game. You have to master one level before you can move to the next, and you can’t ignore the gaps in knowledge. Khan Academy’s website now provides self-pacing software and unlimited access to over 5,100 instructional videos on its YouTube channel covering everything from basic arithmetic to college-level science and economics. It’s the most-used library of educational videos on the web, with 10 million unique users per month, more than 300 million lessons delivered, and over 1.4 billion exercises completed. Khan Academy is based in Mountain View, California, with about 100 full-time engineers and educators. Some students have become interns and, in some cases, full-time employees. “In a bizarre way, we’re solving our own labor problem,” Khan said. Before Khan took the stage, conventioneers heard from NECA President David A. Hardt. Hardt said leaders have made a lot of progress moving the industry forward and told those in the audience to ask their chapter governors for updates. Hardt also mentioned the Value of Membership Task Force and the important work it is doing. “NECA provides tremendous value, but many of our members don’t knoe what’s available to them,” he said. He added the greater participation will ensure that members’ needs are met. Former NECA President Dennis F. Quebe later provided an update on the Academy of Electrical Contracting and its recent progress. Thirteen new inductees were introduced and installed. Alex Owen, chairman of NECA’s Political Leadership Council, also shared remarks and encouraged members to be engaged to make sure their voice is heard.